Today’s photo image above is from Klaus Dona’s new DVD available from Amazon entitled: “THE KLAUS DONA CHRONICLES: Secret World 1” 2011 DVD, which includes discussion of forbidden archeology, lost civilizations, crystal skulls, ancient world maps, mysterious continents, atlantean relics, golden space craft, tools that defy technology, and much, much more data…! 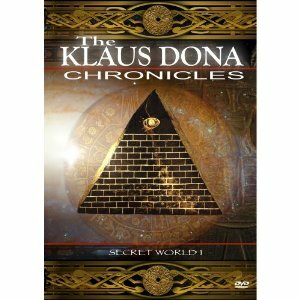 You can purchase this DVD now from http://www.amazon.com and you can view ancient research from Klaus Dona http://www.unsolved-mysteries.info and click onto the language you use. Klaus Dona of Vienna, Austria is an incredible researcher into our past and exposes a ‘past’ most of the world never knew existed…? I’ve had some incredible discussions for the last couple of days with Augusto Perez, who told me about the anomalous experience recently in Florida of ‘shake’ and ‘sound’ which lasted 30 minutes, yes, 30 minutes in time. Augusto Perez is still in Live Oak, Florida [northern Florida] and his website is http://www.theappearance.com be sure to see his vision and dream experiences listed there..! Augusto Perez will be a guest tonight, Saturday, March 26, 2011 on Watchman Radio, along with Michael Boldea, Jr. of Romania [Hand of Help Ministry] 11pm eastern, 10pm central, on Shortwave Radio: 4.840 mhz. or on the internet at: http://watchmanradio.com or wwcr shortwave radio. Someone sent me this interesting LINK for the Destroyer, Brown Dwarf, etc. OBJECT with the title: Comet Elenin? Instead, Brown Dwarf: Nibiru? by AstrolPatriot, so the LINK to see this video is: http://www.youtube.com/watch?v=4t00Rw9S_8k Check the visual data out…. Stan Deyo recently recorded a very interesting show with Omega Man Radio Network on March 24th, and the LINK to that recording is still active at the DEYO website [top part] http://standeyo.com LISTEN! or go to http://www.omegamanradio.com or Blog Talk at http://www.blogtalkradio.com/omegamanradio check archives. Folks, we are in very serious times and be sure to be physically prepared as possible, not to negate the spiritual prepardness, but these ‘changing’ times are rapidly moving beyond our ability to keep up…? Buckle that seat belt, may be an ART BELL ~ wanna take a ride? Larry, Thanks for the information will give me something to do this evening. Lots of listening and praying about these changes……..D.
Thanks for this, Larry! May I copy this info into Global Rumblings blog? – with a link to your blog of course.. We are living in interesting times. Sure appreciate all you do! Yes, copy & use as you need!…Thanks! Thank you Larry… Seems we’re getting humming, rumbling noises all over! One of my Facebook friends who lives in NE Florida around Jacksonville, told me that she and others heard them too! Police said it was from the ocean, as the sound was stronger from that side. Yikes! Creepy on a day when my cell phone keeps going out of service (never happens here!) and my yahoo mail won’t send! I heard a weird rumble here in Michigan straight across the big lake from Milwaukee where a rumble was also heard. Sounded like a whole bunch of big trucks idling, like at a truck stop…..but there are not even freeways within 80 miles of here and the biggest is M31 (Over a mile away) which is pretty quiet at 3a.m.! I looked out the window but couldn’t see any thing in the neighborhood and big trucks are restricted to stuff like furniture deliveries and only during the day….small town so I would have heard about it if firetrucks (we have 2 that could have made enough noise I guess) had been out! Yes, we’ve been hearing of many reports of ‘strange’ rumbling sounds a number of places! Thank you Larry for all your doing. We truly cannot keep up anymore can we? God’s blessings to you and yours! Plans for Denvers new waterport ? If this is true it is not good news.Japan is doomed so is USA coastline,They have a method to their madness!!! LARRY , YOU ARE A BLESSED FRIEND TOO ME AND I PRAY THE LORD KEEPS YOU LIFTED UP TO DO HIS WORK AND LIVE HIS WORD AMEN . THANK YOU LORD FOR SHARING A BROTHER OF THE LORD AMEN. This blog keeps getting better and better. What happened? Did the Lord send you a secretary (LOL!!) ?? Just a note to let you know we are still here. All my emails to you have been bounced back. We are still here, still watching, still monitoring, and awaiting the blowing of the trumpet.